If my earlier entries haven’t been any indication already, the grass fed beef scene is hitting it big in Los Angeles. I’ve previously reported on sit-down and fast casual restaurants serving the sustainable meat. Now in the ever expanding food truck world is a mobile eatery that serves grass fed burgers. The LA food truck industry is already known for some of the best burgers in the city, but the Patty Wagon stacks up on the very top of the burger trucks. Every Friday at work, we have a different food truck outside our offices. 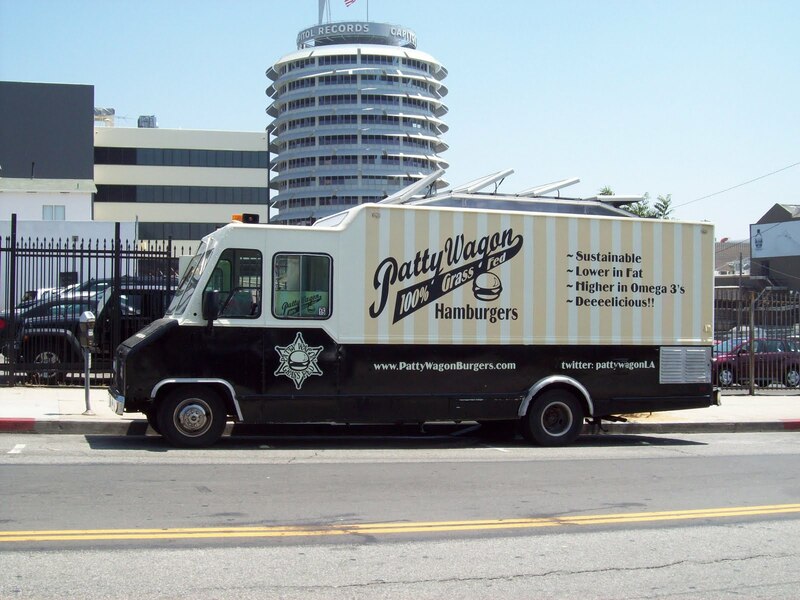 I was ecstatic when I heard The Patty Wagon would be the truck of the week. This truck says in its logo that it serves 100% grass fed beef, but that’s only the start of its commitment to sustainability. While looking at the diverse burger options listed on the truck, underneath were all bottles and cans of soda pops made from cane sugar instead of high fructose corn syrup. Everything from Mexican Cokes to several varieties of Hansen’s Natural Sodas. Another great thing about the Patty Wagon is that it serves mini burgers a little over two ounces, since we as Americans eat much larger portions of meat than we need to. I decided to go with two of them, which still made for smaller portions than many other places. I love peppers on my burgers, so I decided to do one with sweet peppers called You’re My Everything and one with jalapenos called I Get a Kick Out of You. And what’s a burger without fries to go with it? 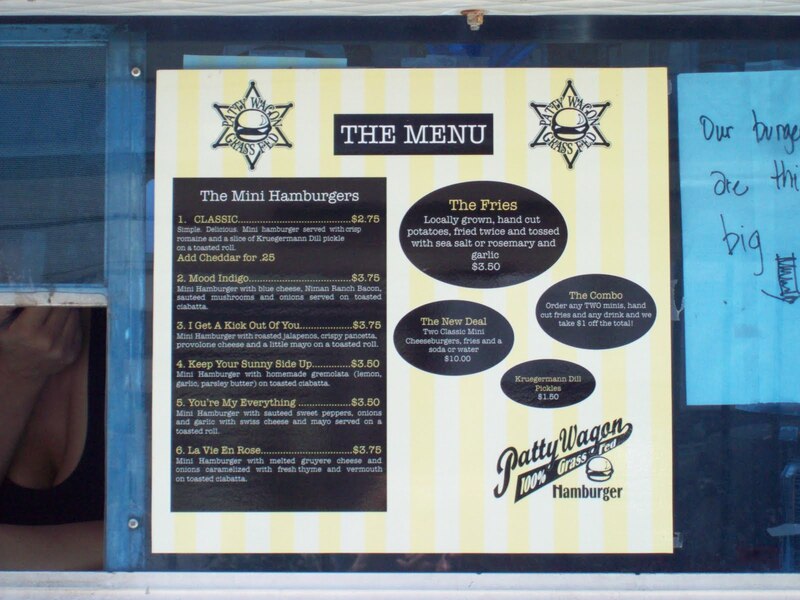 The Patty Wagon serves fries made from organic potatoes. Potatoes fall under the dirty dozen of foods with the most pesticides. It was icing on the cake to see that the fries were organic. Ordering one burger with sweet peppers and one burger with spicy peppers made for a great yin and yang. I started with the sweet peppers burger. It was nice and juicy, the way grass fed beef should taste. The portion of peppers and mayo were the right amount as they didn’t take away from the mouth watering patty. The peppers were a little bit light on taste, but made for a good warmup to the spicier burger. Now onto the jalapeno burger. This one easily had the stronger flavors to go with the premium tasting meat. But all of the beef’s flavor could still be tasted amidst the spiciness. The burger was also topped with pancetta. Often meat topped with meat can be too much, but this pancetta was sliced nice and thin to just add an extra layer. My only criticism of the Patty Wagon’s burgers were that the buns could’ve been toasted a little less. 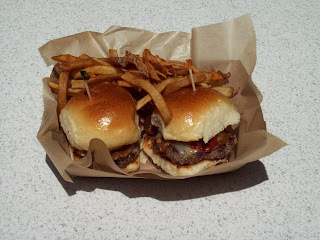 I’m glad to see a food truck serving burgers on brioche buns, but toasting them too much changes the texture. A brioche bun has so much richness in itself. I know some people prefer bread toasted, but I’d like to see Patty Wagon at least give people the option to have the buns untoasted. After savoring every bite of my two mini burgers, I moved onto the fries. These were twice cooked, which makes fries taste even better. The fries had a nice crunchy edge to them as they were cooked nice and brown, but also had a softness inside. I love how they were sliced super thin, almost a noodle like shape. 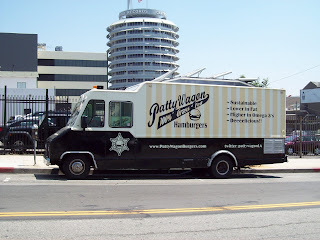 The Patty Wagon chalks up another victory for grass fed beef in LA. It’s the best burger truck and one of the best all around food trucks.